The details for the threshold bottom / step height are the size for the bottom piece of outerframe for doors that have not been sunk / dropped into the floor, see technical drawings or speak to our technical department regarding finished floor levels. A 190mm cill and 225mm cill are also available for our two track patio doors. The details for the threshold bottom / step height are the size for the bottom piece of outerframe for doors that have not been sunk / dropped into the floor, see technical drawings or speak to our technical department regarding finished floor levels. Heavy duty interlock, standard double-glazed units, 90% argon gas filled (low-E, en=0.05, soft coat), 16mm or more (1.0 Glass - U Value centre Pane*). For example we offer Planitherm ONE 24mm units (Oct 2010 Part L Compliant). 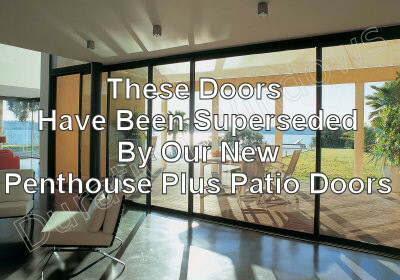 High weather rated patio door, suitable for use on the ground floor up to sixth floor. Standard Interlock is suitable for use on up to the first floor and doors up to 2350mm tall. Heavy Duty Interlock is suitable for use on up to the sixth floor, properties in exposed locations (i.e. by the coast) and doors up to 2700mm tall. ¹ After a given panel size (m²) sealed units will need to be laminated. These larger panels cannot be supplied glazed due to the size and weight of the glass. Ask for more information.